Rear shackle set with metal bushings for 1932 - 34 car & 1/2 Ton pickup. Set of 2 shackles. 1935-40 Rear Spring Shackle Set, Metal Bushing Type, Also Fits Pickup To 1941. Set of 2 shackles. 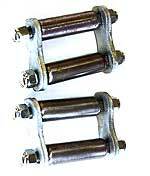 Set of 1941 Front Spring Shackle Bars for the front spring shackles. Rear spring shackle bush kit for the 1948-56 Ford V8 pickup. Set includes Includes 6 large pins and bushings and 6 small pins and bushings enough for both springs. 1949-51 Spring Shackle Bush 8A-5719. Normall fitted to the 1949-51 Mercury front and rear spring shackles. Size ID=1/2" OD=7/8" Total length 1 7/16" Length without lip 1 1/16"